Well the time has come again to take another pass by the distant binary star system Mira… Okay, perhaps not. Instead the time has come to revisit the computer system that I’ve called Mira: an Intel i7-5820k built into the NZXT H440 with water cooling provided by a custom radiator box. Last we left, I mentioned the desire to upgrade the graphics cards in Mira away from the pair of PNY GTX 770s (which are basically the same as a pair of GTX 680s) for something a bit more recent. In my wife’s sytem Absinthe, I upgraded her to the GTX 1080, but I’m not going that high. I stayed one step lower and went with the GTX 1070. 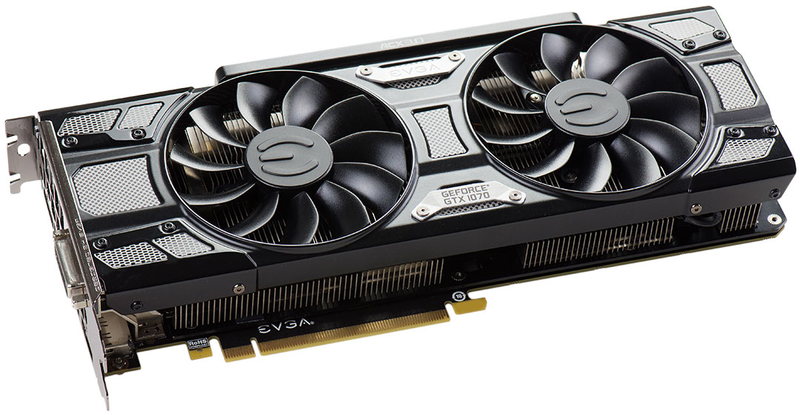 Specifically the EVGA GTX 1070 SC Black Edition. When installed it’ll put the CPU as the only hot item on 9x120mm of radiator space until I get a water block. The temperatures are already phenomenal (38C average core temperature while encoding video), so I’m not expecting much improvement on that. Going from dual graphics cards to a single GTX 1070 will also free up a slot on the mainboard for a 10GbE SFP+ card as part of my 10GbE home network upgrade. Cable management will need to be redone in the H440 as well since I’ll be going from two graphics cards requiring four PCI-E power connectors to one graphics card requiring just one 8-pin connector. I’m also taking this as an opportunity to revisit the radiator box. Again. This time it’ll be with the aim of silencing the D5 Strong pump. I ordered an anti-vibration pad and I’ve been looking at other ideas for vibration isolation with the intent of doing what I can to isolate the pump. One idea I’m currently entertaining is using the pad as a base for creating a small bag for enclosing the pump entirely, with the hope of not only isolating it for vibration but also any sound. I derived this idea from the YouTube channel DIY Perks. In his video about an ultra-silent PC build called “Cloud Unit” (embedded below), Matt housed a laptop HDD in a small bag made from an old towel to absorb sound and vibration. There’s not nearly the concern about heat with a D5 pump since it’s designed to dump its heat into the fluid it’s pumping. And while silence would certainly be golden, vibration is the thing to tackle first. And there are a lot of products and entire companies out there for this purpose. You’re probably familiar with the anti-vibration pads, washers, and the like. I’ve attempted to use plumbing washers for anti-vibration as well — they work well for a D5 Vario, but not so well for the D5 Strong. There’s also a plethora of fasteners designed for isolation. It’s just a matter of what’s available and compatible with the pump housings and the setup in question. Again there are a lot of products available for isolation, some that may not look all that great in a computer build, so plenty of research to be done in the interim. But for now I’m going to see how well the anti-vibration pad I purchased will work while considering other ideas. At under 5 USD, it’s an inexpensive experiment that should give some value. The new GTX 1070 is sitting in a test setup as well to make sure it’ll work as expected and determine the extent of any coil whine. The hope is anticipating a potential RMA before tearing down Mira. The test setup is an FX-8350 on a 990FX mainboard that will be used for a second 10GbE switch in my home network once the last of that hardware arrives. One interesting observation to make: while running Valley or Heaven Benchmark, the fan never started on the 800W power supply I’m using to power the test setup. It’s certainly great to see that NVIDIA’s Pascal GPU core can provide greater performance over Maxwell (with the GTX 1070 outpacing even the Titan X Maxwell) at significantly reduced power requirements. In initial testing, the GPU core never broke 70C with EVGA’s ACX 3.0 cooler.